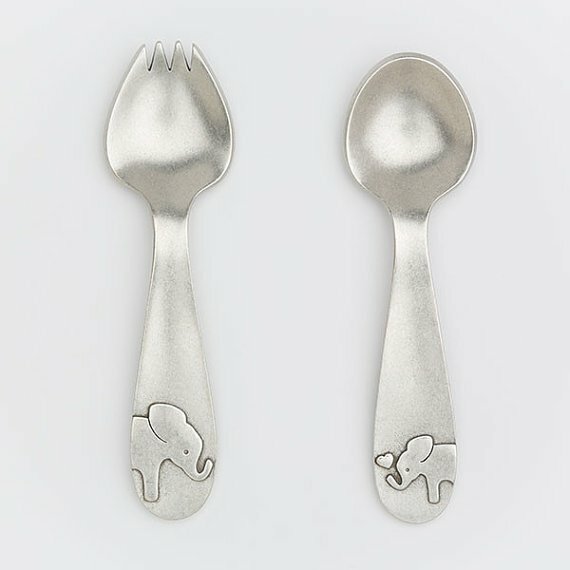 A delightful elephant spork and spoon that are perfect for babies and toddlers just learning to feed themselves! 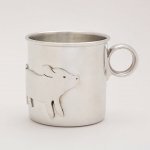 The raised elephant designs (which wrap around to the back of the utensils) help little hands grip securely. We designed these spoons to be sturdy and functional, as well as fun and cute! Once baby has grown, they are sure to be treasured as family heirlooms and passed down to future generations.Our spoons are hand cast from lead free pewter in our original molds. This set is nestled into a gift box and includes a cute card describing care instructions. Please hand wash these spoons keep them looking their best! Each utensil is approximately 4.75 inches (12 cm) long.All of our pewter items are food safe, lead free, and meet all CPSIA safety guidelines for children's feeding products.